Most people with any interest in Rolex are well acquainted with their legendary, multi-time zone pilot’s watch, the GMT-Master. Although the various GMT-Master and GMT-Master II references with their soda-themed nicknames have become mainstays within the vintage collecting world, there is an additional (and incredibly rare) iteration that receives far less attention: the Rolex Blueberry GMT. 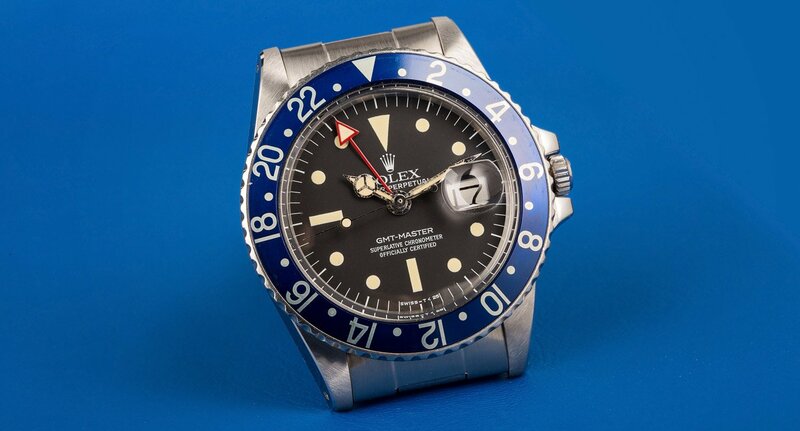 The GMT Blueberry is a vintage Rolex that has garnered the attention of many. 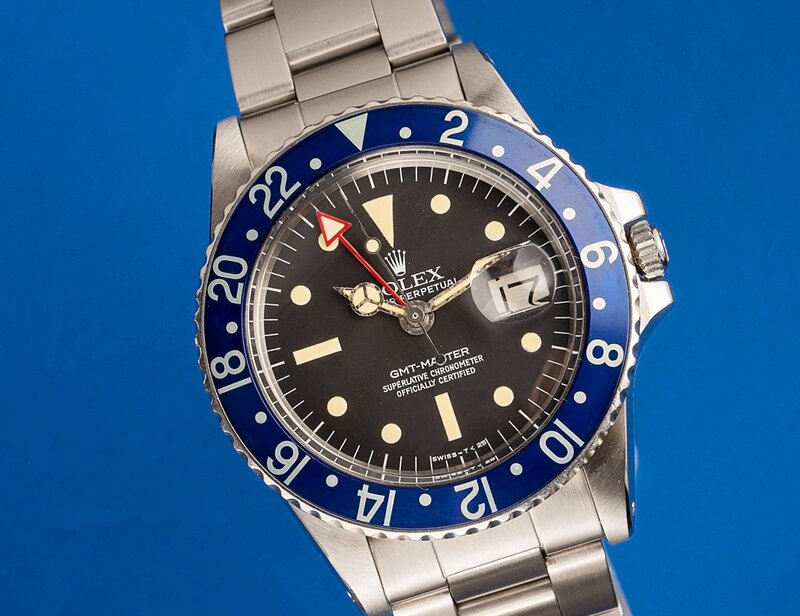 The “Blueberry” GMT-Master is essentially just a regular reference 1675 from the 1970s that was originally fitted with an all-blue bezel insert. Unlike the other colors of bezel inserts that have been available for the GMT-Master line of watches, the all-blue insert of the “Blueberry” GMT is not something that Rolex ever officially offered as an option at any of their regular authorized dealers. Instead, the entirely blue, GMT bezel insert was manufactured in small numbers (primarily for the Eastern market) during the 1970s, and reserved exclusively for special orders by select retailers and military groups – examples can be found with the UAE Air Force emblem on the dial. 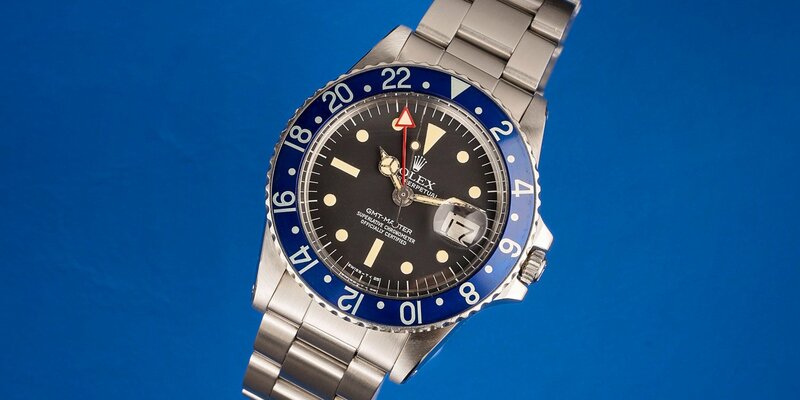 Exact production numbers are unknown; however since the all-blue, GMT bezel insert was never officially offered to the general public, even service replacement inserts would have existed in significantly smaller numbers than the rest of the available colors. The number of these Rolex GMT Blueberry watches are small, so grab them when you get the chance. A very small number of the “Blueberry” GMT-Master watches in existence were originally fitted with their all-blue bezel inserts. Numerous reproduction “Blueberry” GMT inserts are available today; however a large number of the genuine all-blue inserts are not actually original to their respective watches, but rather added on later during a subsequent service or repair. Rumor has it, that although these “Blueberry” inserts were only available for special orders during the 1970s, service replacements were available at certain dealers and service centers for a number of years thereafter. The era of gilt Rolex dials pre-dates the entire window of time in which these all-blue bezel inserts were in production. Consequently, all “Blueberry” GMT-Master watches will be fitted with matte dials with white text, rather than the earlier glossy gilt dials, or later era gloss dials with white gold surrounds for the hour markers. Additionally, the “Blueberry” GMT-Master can be found with either an all-red GMT-hand, or the classic GMT-hand with the red center section; however it should be noted that the all-red GMT-hand variant is generally considered to be less common. The Blueberry GMT is a rare watch that makes collectors go wild. Since the all-blue bezel insert is the only defining characteristic of the “Blueberry” GMT-Master, the price and desirability of such inserts has gone up dramatically in recent years, as an increasing number of buyers have tried to secure one for their own collections. At the present time, genuine “Blueberry” GMT bezel inserts (in well-preserved condition) can be worth significantly more than the value of the entire rest of the watch on which they reside. When considering the purchase of a “Blueberry” GMT-Master, the authenticity and originality of the all-blue bezel insert is going to be paramount in determining the overall value of the timepiece. The reference 1675 “Blueberry” GMT ranks among the most rare and elusive of the various iterations of the GMT-Master that Rolex has produced throughout the decades. As the all-blue bezel insert was not something that Rolex formally offered to the public, production numbers were very small, and official records and information about these all-blue inserts is virtually non-existent. 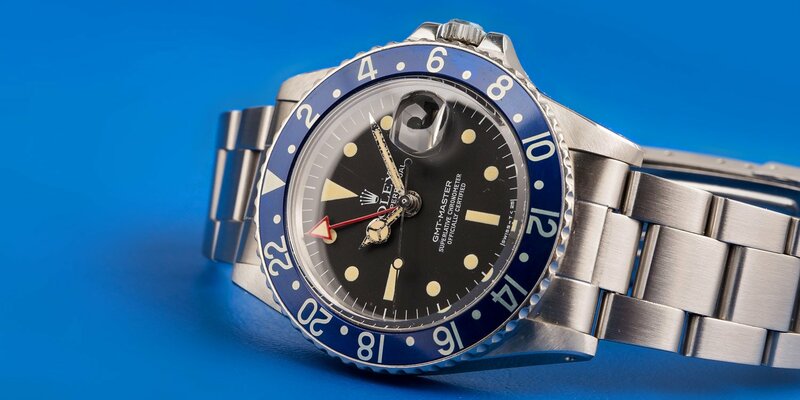 While it may initially appear to be a reference 1675 with an aftermarket bezel insert, the “Blueberry” GMT-Master was actually a watch that Rolex manufactured, and its all-blue bezel insert ranks among the rarest and collectible GMT inserts of all time. What are your thoughts on this Rolex GMT Blueberry?